It’s rare that social scientists studying protest get much attention from the mainstream press, opinion or otherwise. Although the scholars may get a whiff of excitement from the attention, they’re usually frustrated by the distortions and oversimplifications that seem inevitable–almost. Today’s story is about two social scientists, conservative media outlets, and the decline of the peace movement in the Obama era. Michael T. Heaney and Fabio Rojas have been attending antiwar rallies for several years, bringing teams of students with surveys rather than placards. They’ve found that the number of self-identified Democrats at the demonstrations declined after Barack Obama took office. This finding won’t surprise readers of Politics Outdoors. The question of ebbs and flows of movements generally–and the peace movement in particular, is one we’ve taken up before (here and here). Most people are likely to protest only when they believe: something is wrong; it could be otherwise; and that their efforts might make a difference. Democrats seeking the nomination to succeed President Bush flashed their antiwar credentials to primary voters, and Senator Barack Obama’s initial opposition to the war (although he didn’t have to vote on authorization) was an asset against Senator Hillary Clinton (his eventual Secretary of State). He campaigned on a promise to wind down the war in Iraq, which he did, sort of, and increase the focus and forces in Afghanistan, which he also sort of did. This course of action certainly didn’t respond to all of the concerns of peace activists, but it seemed far more promising to most than what it replaced. Some share of the people who might turn out at a demonstration, marked by their willingness to identify as Democrats, stopped turning out. It’s not necessarily that they were satisfied, but perhaps they were less angry or less hopeful (or less willing to claim affiliation with this president’s party on a survey at a demonstration). Protest is a blunt instrument; an action pushes a direction or suggests a veto. The grammar of a demonstration doesn’t accommodate complicated policy alternatives. When the direction seems more promising, the urgency or possibility needed to engage falters for some people. Others may feel they can talk directly to policymakers, rather than shouting at them from the lawn. The demonstrations got smaller and those who did attend had a somewhat different set of concerns than the larger movement. Movements are coalitions, not unified beasts. And people and groups in those coalitions respond to the world around them, figuring out their best shot to move the world in the direction they want and recalculating constantly. The anti-war movement was all over the news before President Obama was elected. 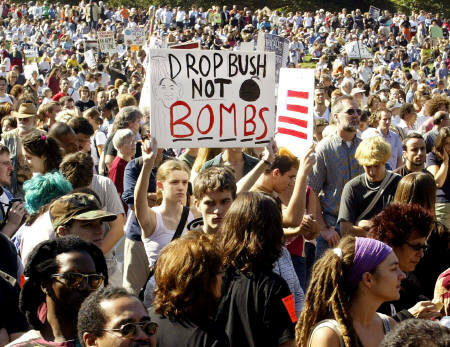 But apparently they weren’t really anti-war … they were just anti-President Bush. Amazing. Especially because the war in Afghanistan ramped up after Obama was elected. American fatalities shot up in 2009 and 2010. The protesters have remained silent over Libya. Now, remember that the antiwar movement included more than pacifists; there were also many people who believed that the war in Iraq was different, unnecessary and unjustified, than the war in Afghanistan. Candidate Obama played to this sentiment in his national campaign–and mostly followed through on it. Libya wasn’t on the antiwar movement’s radar–for obvious reasons. And the United States is bombing, but not sending ground forces, and there is a call for intervention from the Arab League and an indigenous anti-Qadaffi force that is doing the fighting. I don’t mean to endorse the mission here, only to point out that it is fundamentally different from the war in Iraq. So, is there a surprise? Perhaps only that no one at Fox Business or the Washington Times or the Wall Street Journal was able to think this through and get it into print. And, by the warway, this isn’t just an antiwar movement story. Where were the vigorous deficit hawks and tea partiers during the Bush era? And why have the Tea Party demonstrations diminished after the Republicans gained control of the House of Representatives? This entry was posted in academic and tagged peace movement, protest, tea party. Bookmark the permalink.